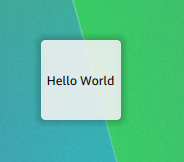 With Plasma 5.2 out I wanted to update the tutorials on how to write a Plasmoid. Going through all of the steps from hello world, to using Plasma Components to configuration through to differing form factors. It made sense to publish them as blog posts before I copy them to the wiki. Behold, the first rather wordy blog post in a series of 7. With Plasma5 we have embraced QML as our technology of choice. It is the only method of writing the UI for plasmoids. Before you get started with writing plasmoids, it is recommended to read through the basics of these and have a bit of playing to get used to the language. We have a specific folder structure with metadata for our plasmashell to be able to load the files. We provide a massive collection of libraries that extend the QtQuick library both with functionality and widgets that blend in with the Plasma theme. Special API exists to interact with the shell, allowing you to save configurations or set default sizes. In this series of tutorials we’ll go through the steps of writing a real plasmoid from scratch, using some of the plasma libraries. By the end we should have a completely working, deployable RSS reader. Plasmoids follow the simple KPackage structure. In the top-most folder there should be a file titled metadata.desktop and a single folder called “contents”. Inside the contents folder we place all our QML, assets and other additional files. We split the contents into subdirectories: config, data and ui to make things easier. In our tutorial we will be making an RSS reader so everything is named appropriately to that. Most of the fields here should be fairly self explanatory. If in doubt, copy this and change the relevant fields. Providing you have followed the recommended reading this should be fairly self-explanatory, we have a text item in the middle of the plasmoid which will say “Hello World”. Over the next few tutorials this will get somewhat larger, we will also see some of the problems with this example; here translations aren’t implemented and the text won’t match the Plasma theme colour. It should now be visible in the plasmashell in the “Add widgets” option along with every other plasmoid. We can then it to our desktop or panel like any other installed plasmoid. Next tutorial, we will cover getting data from external sources. The Plamsa 5.2 beta will be tagged on Thursday this week. If you have any pending features or changes that are going to affect artwork or strings that should be in the release please make sure they get merged ASAP.